If you downloaded the trial version, no registration key is required. Simply run the installation. After 5 minutes, XY Chart NET will stop working and a message box will appear. Simply, stop and restart the application, and XY Chart NET will work for another 5 minutes. 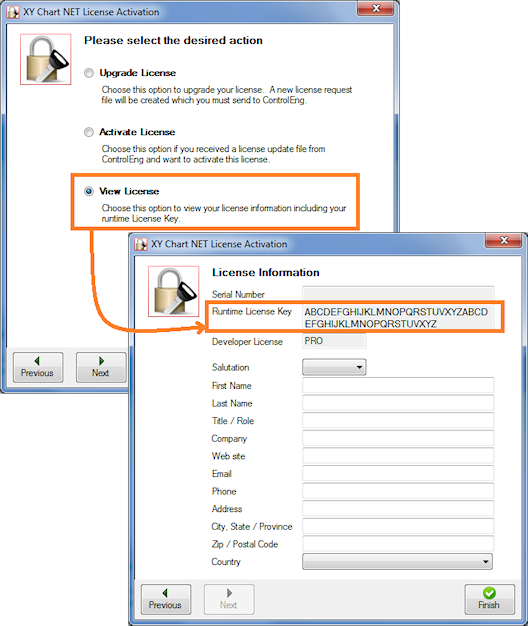 Once you have purchased a license, you will be given a unique registration key and License file specific to your PC, which will enable the Full version. Open an existing Visual Studio project. Activate any form "[Design]" window. Right-click on the mouse over any item in the Toolbox and select Add Tab. Enter "ControlEng" as the tab name. Open Windows Explorer and navigate to XYChartNET's installation folder. Select XYChartNet.dll and drag the item onto the newly created tab. XYChartNET component is now available for use. Launch 'Add or Remove Programs' (via Start > Settings > Control Panel). Select program to remove, 'XY Chart NET'. Select "ControlEng" tab, right-click on the mouse and select Delete Tab. XYChartNET component is uninstalled from system. XY Chart NET v3 is a standalone product and does not require any other files to be installed other than the appropriate Microsoft .NET 2.0, 3.5, 4.0 or 4.5 Framework. The Microsoft .NET Framework Runtime is available for download at Microsoft's web site. Copy the XYChartNetFWX_Y.dll file to the same directory as your main executable. Note that X and Y denote the framework version. Eg. The file for .NET Framework v4.5 is XYChartNetFW4_5.dll. If using the language localization file, XYNLangTableUE.xml, then it also must be copied to the same directory as your main executable. In your application, set your Runtime License Key. The LicenseKey property is an application Global variable, meaning you only need to set it once for one instanceof XY Chart NET. And then it applies to all XY Chart NET instances in your application. 4 . If I compile my program and distribute only the XYChartNet.dll file to my customers, do I have to pay royalties? No. Runtime distribution licenses are free. Specifically, if you only distribute the XYChartNet.dll file and do not allow your customers to develop software using XY Chart NET, then there are no runtime royalties. If your customers can develop software using XY Chart NET, then this is effectively giving them a developer license. Therefore, in this case, a developer license must be purchased. Automatic is exactly that. No programming is required. By enabling the XY Chart NET toolbar, the zoom, scrollbars, pan, crosshairs, and coordinates display functions are automatically available to the user. Up to 100 Y scales and 100 X scales are available. Up to 250,000 profiles can be mapped to any of the 100 Y scales and 100 X scales. 8. Can a number of profiles be displayed while their corresponding Y Scale is not? 9. How do I use DateTime formatting? 10. How to I get data into XY Chart NET? The fasted way to pass a lot of data is using method 2 or 3. If all the values for all profiles need to be updated at the same time, then use method 3, where the dimension of the array equals the profile with the most samples - 1. If some profiles have fewer samples, then when the array is passed to the chart, it will only get the number of samples for that profile. Note: The following two issues only apply when the chart is being used in the development environment (Visual Studio IDE), which requires access to the Registry to manage the license. Runtime applications are not affected. Note: This issue only applies to XY Chart NET v1.x, and does not apply to v3. Cause: Administrator permissions are required in the IDE. Solution: To run Visual Studio as an Administrator, right-click on Visual Studio and select "Run as Administrator" per the screenshot below. The control should drop on the form with no exceptions being generated. "SetRegTimeStamp - Unable to open Registry Key"
Cause: XY Chart NET is a 32-bit control. So the target CPU needs to be specified as "x86". Solution: Open the project properties, select the "Compile" tab, then click on the "Advanced Compile Options" button. Set the Target CU to x86, per the screenshot below. in the 'Online' settings, change to 'Try local first, then online'. Description: After upgrading application to use new XY Chart NET v3 control, compilation fails with error "Unable to resolve type 'XYChartNET.XYChartNETCtl, XYChartNET, Version=1.x.x.x, Culture=neutral, PublicKeyToken=null'". Resolution: XY Chart NET v3 does not require this file for licensing.